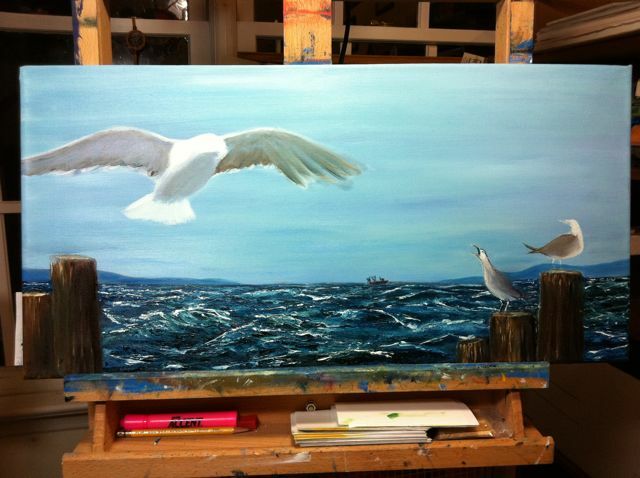 Here’s a current “painting-in-progress” . 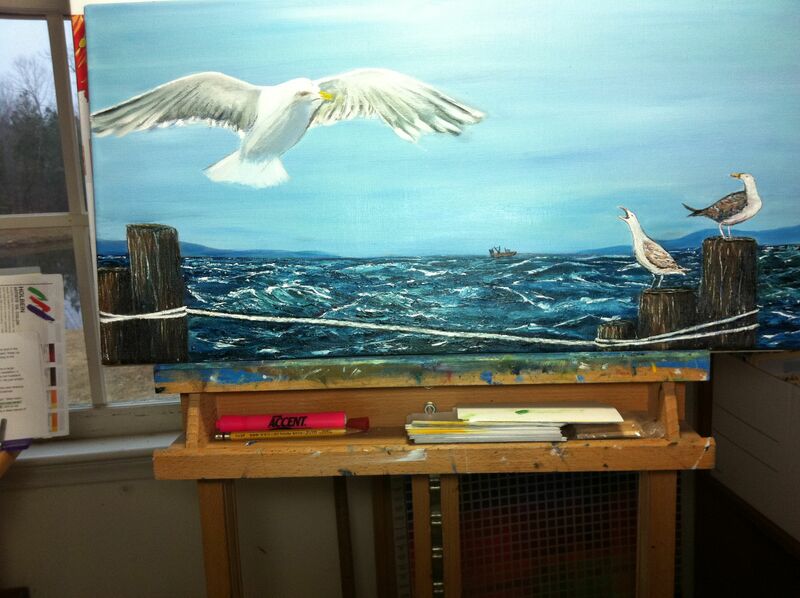 All seagulls need finishing, then some ropes around the pilings and one rope connecting the pilings. I’ll update the pics as I go along. 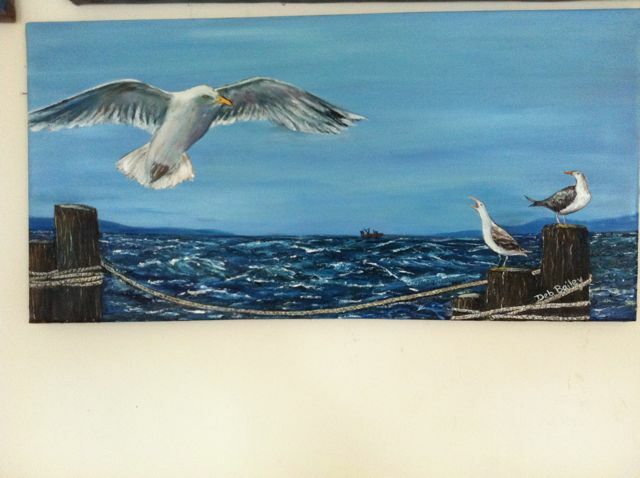 Canvas size is 12″ x 24″ and the medium is my favorite: oils. 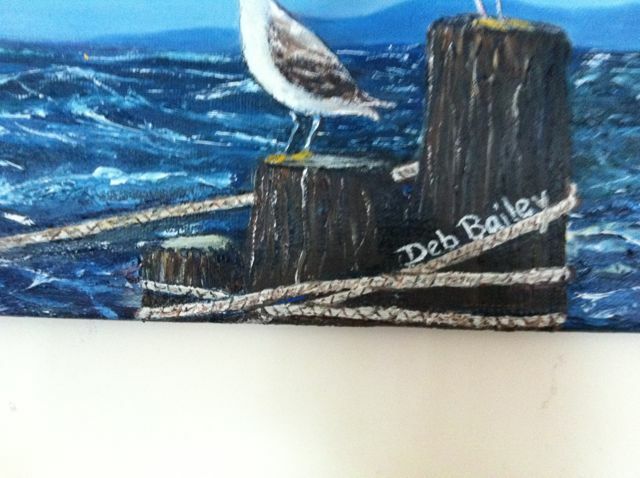 I so love seascapes, sea birds, wooden pilings, stormy seas…. Stay tuned for pictures of progress. I am not a marine scientist so I cannot weigh in on the scientific merits of the free vs. captive dolphin debate. 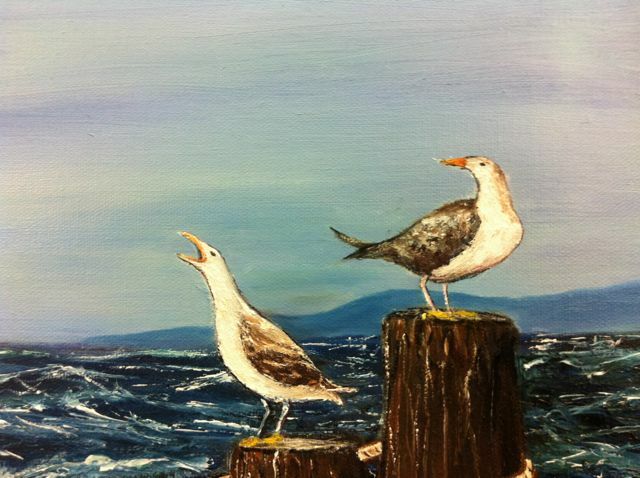 However, I am an artist and there, I can serve the marine mammals. If seeing them in captivity is supposed to forge an emotional connection, then maybe seeing them lovely portrayed in a painting can do the same. I also have a friend who expressed an interest in having a painting of a fish underwater. I think the original will have to be hers, but the prints will become my gift to the world and to dolphins in particular. This morning, on a quest to see how I might approach this endeavor, I spent some quality time on Google images. Did a search on the term “dolphins underwater” and went to the “images” heading. There I found many photos to inspire me. I never actually copy a photo, but I do glean a “feeling” of the animal, it’s emotions, how it holds itself in the water, its soul. But it’s not just the animal I need to “feel” but it’s environment. I need to “feel the fluidity, denseness, and motion” of the water around it along with how the light cuts through the layers of liquid. I need to feel the “temperature” of the environment – cold Arctic waters or warm Caribbean. And is it clear or cloudy with plankton, debris, dirt. I often print out a few key pictures and just stare at them. Soak up their soul, shapes, colors….until I’ve internalized the animal and its space. Next will be “Step 2 – Composition” Stay tuned. My back den is lined with a few boxes along one wall – FULL of printouts of animal stories I’ve found or read over the years. I’ve always felt I was supposed to do something with them – write about them, incorporate them in a story, paint them, something. But I never could figure it out, so hence, there they sit, in boxes and here I sit, drowing in animal stories. In re-starting my blog I decided to focus on my art and art business, having taken a break from novel-writing. 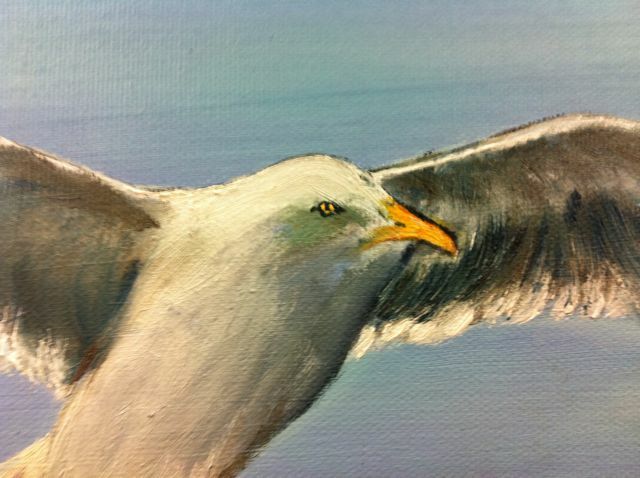 I realize that the focus of both of those topics is NATURE ie all my paintings and photos have to do with nature and animals. In my last few posts, I’ve shared some interesting NATURE and ANIMAL links. It suddenly occurred to me that perhaps there is something I can do with some of those stories and new ones I come across – share them here. Sometimes just to share, sometimes to comment on. I may even try out some Haikus. But in some form or another, those tidbits of the natural world may finally have a use, and see the light of day. So while some blogs focus on sports, or movie stars, or religion or politics, and certainly I may touch on one or two of those now and then, my blog must reflect my main interests and that is – the glory that is nature. My gift to you all, and my gift back to the natural world. The Post – The Challenge of Animal Cams…. Animals are like kids – it’s a major challenge to get a good photograph of them. When I got this photo for “Hey Baby!” I must have shot almost 200 photos. Either he wasn’t positioned right, or he moved just as I clicked the shutter, the lighting didn’t highlight him right or I screwed up and used the wrong ISO or lens, or I used aperature priority when I should have used auto. Then of course, you can’t tell a fiddler crab “come on baby, work we me, yeah, flick your hair, turn, smile….” And of course, the times he was in perfect position waving his claw, I was just in the middle of something else with no camera handy and by the time I grabbed the tripod and set up the camera, he was doing something else. Suffice it to say tt was a major challenge getting one shot that he looked good in that was in focus, lit right etc. I kept wishing I could have put my camera in the tank but too distracting and upsetting for Admiral Byrd and too awkward for me….not to mention I didn’t have one of those waterproof housings and my camera was too big for the tank. I would have loved one of those smaller cameras you can just set up – a “fiddler cam.” Ultimately that is the answer to good pics I think….at least in terms of spontaneity and not upsetting him, but who knows if the kind of cam I could afford would focus well etc. I’ll just stick to fiddler crabs…. 🙂 have a nice day. The Post – Hey Baby! …. A Tribute to Admiral Byrd. He was always there – strong, intrepid, fearless, hopeful. He never stopped waving his claw even when he was the only crab left. We’d come back from being out and would peer into the house from the garage door and we could see him – standing on his tank rock, the dark kitchen lit only by the light of his tank, all alone in the house, tank, world, and still, he was waving. Fiddler crabs wave their claws to catch the attention of passing females in the hopes the female will choose the home they have made, instead of some other male’s nest. They also wave them to warn other males to stay away. Admiral Byrd was the uncontested master of his world – the 10 gallon tank in our kitchen. He was one of three fiddler crabs we bought over two years ago. In that time he outlived Peter Lorre, Rhett Butler, Scarlett O’Hara, Melanie Hamilton, the Three Muses and a couple other males who didn’t live long enough to be named. He was the only one of them who was ALWAYS out exploring his tank – the females rarely emerged from the inside of their rock and the other males just sat in their rocks. He was always marching about the tank, even when he was brand new and he had no idea if this aquarium place was a deathtrap or a blessing. Admiral Byrd was the first, the best, and eventually, the only. There was only one Admiral Byrd and he lives on in our heart. I buried him outside, just as I’ve done with the dogs, gerbils, hamsters, and rat. Because he was such a special creature in spite of being our smallest pet, I buried him in my meditation corner, right next to my statues of Buddha and Mary. (They’re a story for another day). Now, to commemorate what a tremendous spirit he had in spite of being such a small creature, I honor him with this image of him in classic Admiral Byrd pose – out and waving. He is the logo picture for my Cafe Press store, and I have a whole line of products – mugs, T-shirts, note cards. I even have a case for my iPhone 4 that carries his picture. The “Hey Baby!” quote captures his unbreakable and commanding spirit. Humans could take a lesson from his never giving up. The Post – I won the Battle of Photoshop!! I was struggling with putting my images up on the Cafe Press site for my nature art products. I wanted the image of my fiddler crab, Admiral Byrd, as the main pic for the site and for its own product line. Sounds good. Loading the image went fine but even though I used 72 pt font to type in Hey Baby! you could barely see it on the products or even the site’s picture. I tried everything – layers, putting the text in a canvas border (boy did that look stupid) , trying to downsize the picture (even though that’s an even stupider idea than putting text in the canvas border). How was I going to get big enough letters to show up on a high resolution image????? FINALLY I decided to go back to my book, Photoshop Elements 6 for Mac. I had spent a couple of hours going through the book earlier, with no help. But this was like God sending St. Peter back out to keep fishing after a whole night of no fish. You go back and try one more time and WOW! Talk about God sending a lightening bolt. Lo, THERE, on page 390, which my book just HAPPENED to open to, was the answer: “How Resolution Affects Font Size”. Did anybody here know you could get a bigger font size than what was in the drop-down menu???? I didn’t. As it turns out, you can just type in your own font size. And based on how tiny 72 was, I went for 150. PS Looking over posts unfinished from last year, suffice to say the ants died and that project ended quickly, at least for then. I’ll revisit at some point. As as for the Muses – they and Admiral Byrd are no longer with us. But Admiral Byrd is buried outside next to my statues of Buddha and Mary. He deserved to be honored and they will watch over him. You are currently browsing the archives for the Mosaics Created category.